Continuous advances in science and technology have enabled humans to explore diverse realms. We have traveled across the Earth’s surface, atmosphere, and neighboring regions of space and amassed knowledge of various phenomena, gaining insights that paved the way for today’s prosperity. Yet, there still are many worlds that we have only begun to explore—the deep sea, the Earth’s interior, the vast reaches of outer space, and, at the other end of the spectrum, the microscopic universe. Optical microscopy, electron microscopy, scanning probe microscopy (SPM), and other tools have allowed us to peer into domains invisible to unaided human eye. Our observations of microorganisms, cells, molecules, and atoms have revealed various phenomena and elucidated their origins and physical properties. Today, we are even able to characterize phenomena based on knowledge of configurations and interactions among the smallest units of matter—atoms and molecules. Nevertheless, many corners of the nano world remain uncharted; science and technology are currently unable to provide an accurate portrait of nanoscale structures and dynamics. This limitation represents a significant barrier to the further advancement of science and technology. In the life sciences, determining the behavior of proteins, nucleic acids, and other cellular components—basic building blocks of the human body—is a key step toward fundamentally understanding and controlling the mechanisms of complex biological phenomena, such as disease, senescence, and the emergence of life itself. However, we lack a detailed grasp of these dynamics. Many nanoscale properties of intra/extracellular space have yet to be mapped out, limiting our ability to fundamentally understand biological phenomena, such as disease and aging. Our institute (NanoLSI: Nano Life Science Institute) will explore these uncharted realms with the aim of elucidating the mechanisms of biological phenomena at the atomic and molecular levels (nanoscale). To advance this mission, we will create innovative technologies for direct observation, analysis, and manipulation of intracellular and cell-surface nanodynamics. 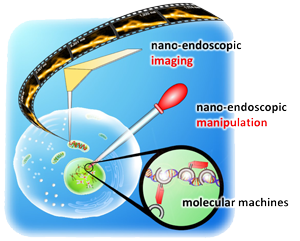 First, we will develop a tool for “nanoendoscopic imaging” that, similar to endoscopic imaging of the stomach cavity, will enable direct video imaging of intracellular nanodynamics. We will seek to achieve on the cellular level something akin to therapeutic endoscopy, which includes endoscopic sampling/analysis of foreign matter in the body and drug injection. Our “nanoendoscopic manipulation” technology will make it possible to sample/analyze specific nanoscale substances in cells and to control the function of receptors and other biomolecules via molecular machines with high-level control functions. 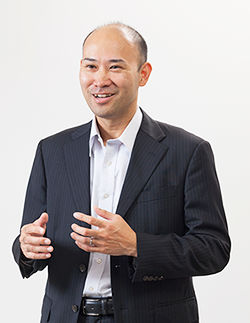 Capitalizing on our innovative technologies for nanoscale measurement, analysis, and manipulation, NanoLSI will seek to establish a fundamental understanding of all the life phenomena such as the emergence of life, illness and aging. However, we have decided to initially focus on cancer. This focus on cancer has clear significance, as overcoming intractable diseases is a major goal in society, and has considerable research implications. Cancer involves many different types of molecular dynamics, including stemness (i.e., the ability of cells to proliferate by self-renewal and to differentiate), intra/extracellular signaling, and genome dynamics, and the elucidation of these dynamics on the nanoscale will provide a fundamental basis for understanding a wide range of biological phenomena. Furthermore, cancer research proceeds from a model defining normal and abnormal cells; this comparison can be used to determine the relationship between cellular-level abnormalities and abnormalities in the underlying molecular dynamics. This goal cannot be achieved solely by nanometrological researchers. Naturally, medical/pharmaceutical scientists specializing in oncology, supramolecular chemists with expertise in molecular sensor-based nanoanalyses and nanomanipulation, and mathematical/computational scientists who can perform multiscale simulations are needed. NanoLSI will strive to achieve the aforementioned goals through collaborations among researchers with world-class track records in various fields. We will further build upon and expand this foundation to pioneer unexplored nanoscale realms and thus evolve into a one-of-a-kind research institute, without parallel anywhere else in the world.